The Nubra Valley, once on the trading route that connected eastern Tibet with Turkistan via the famous Karakoram Pass has been opened recently to the tourists. The Nubra Valley literally means the valley of flowers. Nubra Valley is situated in the north of Leh. The average altitude of the valley is about 10,000 feet above the sea level. The Khardong village, Khalser and Deskit are the main villages of Nubra valley. At first glance, the valley seems parched and dry, but this is prime farming land by Ladakhi standard. Here the farmers grow apples, apricots and barley and harvest the orange berries of the Tsetalulu. Dotted around the valley are ancient gompas and ruined palaces and villages are close enough together to make this magnificent walking country. The people of Nubra Valley are friendly and hospitable. The Nubra Valley is indeed a precious treasures of Ladakh where people still living in the complete isolation for most of the year from rest of the world in the heart of the great Himalayas. 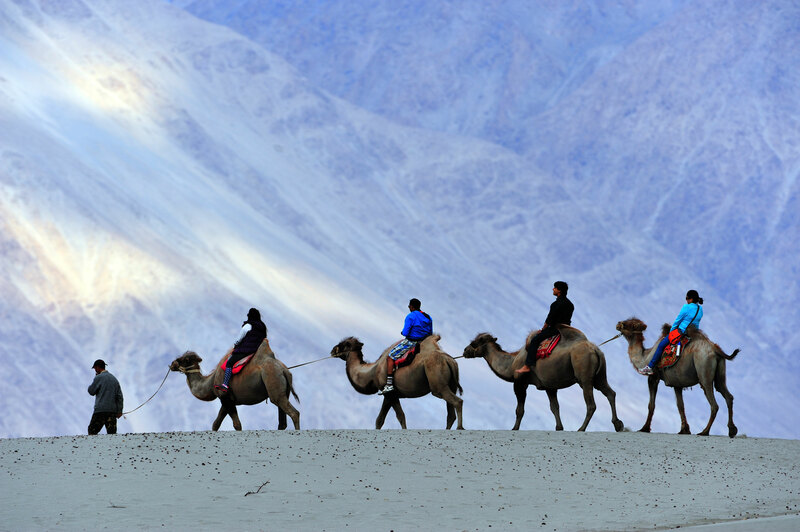 The main attraction of the Nubra valley is Bactarian Camels (double hump Camel). These camels can be seen around sand dunes. Other attractions include Deskit, Samstanling monasteries and Khardung la Pass (18,380 feet) above sea level. For tourists its ideal to spend here two to three nights. However, you do need a permit, which only allows travel as far as Hunder and Panamik for a maximum of seven days. You must handover the photocopies of your permit on both sides of the Khardung La and also by the bridge to Sumur. The main tourist attractions in the Nubra Valley are Diskit, Panamik, Samstanling monasteries and Khardung la Pass. People traveling to Nubra Valley are advised to take enough eatables and drinking Water etc. as people in the valley do not have much to offer you from their winter reserves. On the way most of the vehicles you meet are the Indian Army trucks. Diskit is the main habitation and administrative center of the Nubra Valley. Sprawling over the floodplains on the south banks of the Shyok river, Diskit is situated on the edge of a desert on the Shyok-side valley. Due to unmatchable beauty of this valley, an excursion made here in unforgettable. The valley surrounded by the Himalaya mountains offers spectacular views. While descending into the valley after a few kilometers one would come into a surprisingly green landscape with high stone formations appearing like if sugar was poured over them. In the valley the landscape changes from the green oasis to desert. The main habitation, the town of Diskit makes an impression of being rather an empty town. There are several government offices in addition to the usual cluster of the whitewashed farmhouses. The Diskit village offers Guest Houses and lower budget hotels. The main attraction here is the 17h century Diskit Gompa, reached by the winding road or the dirt track starting near the stream in the middle of the village. Some stone steps climb to the main prayer hall, which enshrines a huge Maitreya statue and a giant drum. Upstairs is a dramatic lookout and a second chamber with effigies of demonic protectors. The gompa holds a major festival of Dosmoche in February. Downhill is the photang of the head lama of Nubra, dwarfed by the enormous statue of Chamba. Beyond Diskit, the highway passes through a wide area of rolling sand dunes before reaching the sprawl of farmhouses and scrubby trees at Hunder. The foreigners can only travel as far as the bridge at the west end of the village. Immediately before the bridge is the squat Hunder Gompa, containing a large gilded statue of the Chamba. Across the road, a crude trail claims to two crumbling Buddhist temples and the ruins of a vast compound of pilgrims quarters. The fort at the top of the bridge offers inspirational views, but the exposed scramble up here is not for the fainthearted. The Camel safari can be organized from Diskit to Hunder village. The Safari takes around two hours. Hunder village has small monastery and it is located on ancient Silk Route. On the far side of the valley, another dramatic gorge runs north along the Nubra river. Sumur is the largest village here, a pretty, green settlement with some interesting Buddhist relics. About 1 km uphill from Sumur is the huge Samstemling gompa, with a school full of friendly novice monks and a number of old and modern prayer halls full of quite distinguished murals. Further north on the main road is the small village of Tegar, with a small, adobe gompa enshrining a giant prayer wheel. Above the road are the burnt out ruins of the Zamskhang palace,a former residence of the kings of Nubra, surrounded by the tiny stupas filled with thousands of votive clay tablets left here by pilgrims on the Silk Road. There is another medieval gompa a few kilometres north at Pinchimik. Panamik is situated about 28 ksm. north of Sumur. The farthest place the permit allows one to visit in the valley is Panamik, the last settlement of any size before the Tibetan border. Panamik is the most northern point open to foreigners in India. Further to that, the sensitive military area starts. The soldiers guarding the border are friendly and are happy to see the visitors too. The hot springs of Panamik are also worth visiting as to feel the warm water which is rare and valuable in the area. The Ensa Gompa is 250 years old and lies on the top of a rock and overlooks the snow-peaked mountains of the valley. This Gompa seems not very far away but one needs to walk 6 to 7 hours to reach the Gompa.